TEN crews came to the Eyot Centre, Wargrave Road for the first of this year’s Henley winter series of races last weekend. Crews competed in a 7km time trial pursuit which starts at the Eyot Centre and heads downstream to turn around Temple Island before heading back to Marsh Lock then turning back downstream to finish at the club. This year the series is for mixed rather than open crews meaning of the 20 paddlers in each boat at least eight must be female. In previous years when the race was open to any crew the habitual winners were the Rafters. Under the new mixed crew rules it was once again the Rafters who topped the time sheet, beating Wraysbury, the current world club champions and Hurricanes who finished third. Henley Dragons finished fifth and now look forward to the next race which will take place on November 8. 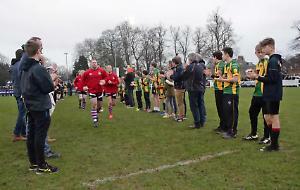 • Anyone interested in joining the club, that train on Sunday mornings at 10am, should see www.henleydragons.com for further details.